Homeowners can itemize certain closing costs at tax time. A much-lauded aspect of home ownership is the ability to "write off" certain housing expenses. Taking a deduction on your tax return reduces your gross taxable income, thus saving you money for the tax year in which you paid the expense. In addition to the recurring expense of mortgage interest and property taxes, you can deduct one-time loan fees known as points that you pay at closing. 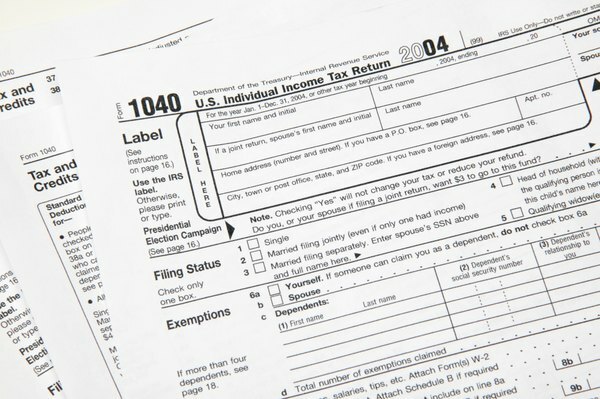 In order to deduct the permissible closing costs, you must itemize on Schedule A of IRS Form 1040. As opposed to taking the standard deduction, itemizing requires you to keep track of each deductible expense and list the amount paid when you file your return. The Department of Housing and Urban Development requires the settlement agent -- either an attorney or escrow company -- to provide you with an itemized list of the closing fees you paid. The HUD-1 Settlement Statement is an important tool you'll need to take the appropriate deductions when preparing your taxes. Most home buyers must finance their purchase with a mortgage, or home loan. Mortgage interest is required on a new loan for the remainder of the month in which the loan funds, the total of which is tax-deductible. A borrower whose transaction closes on January 15 must pay the lender 16 days' worth of mortgage interest to cover the remainder of the month. Prepayment is required, because the borrower's first loan payment is typically due more than one month after closing. You can list mortgage interest paid at closing on line 10 or 11, depending on whether the lender included the amount on your Form 1098, which is mailed to you in January after closing. Homeowners must pay their portion of real estate taxes at closing. Property taxes are typically paid annually or semi-annually. At closing, the settlement agent collects a certain amount of taxes, at least through the remainder of the month in which you close. The seller may have paid taxes beyond the closing date, entitling the seller to a reimbursement of prorated taxes, which is debited from buyer closing costs. As the new homeowner, your fair share of taxes includes the day of sale and beyond. You can deduct your portion of taxes paid at closing on line 6 of Schedule A. Mortgage borrowers may pay points to acquire a loan. The lender or mortgage broker charges a percentage of the loan amount in origination fee. The origination process may include taking the application, finding the loan, approving and funding it. These points are equal to 1 percent of the loan. A loan may also include discount points, also known as buy-down points, that lower the interest rate. In this case, each point lowers the interest rate by 0.25 percentage points. A lender's premium is another type of charge, expressed in points, which a borrower can pay so the lender covers his closing costs. Points are deducted on line 10 of Schedule A.